An open-air art project of a different kind, by Shanghai artist Yang Yan, entitled "Immersed dreams". As part fo the Expo2010 festivities, this one was commissioned and will stay at the banks of the Hangpu River. 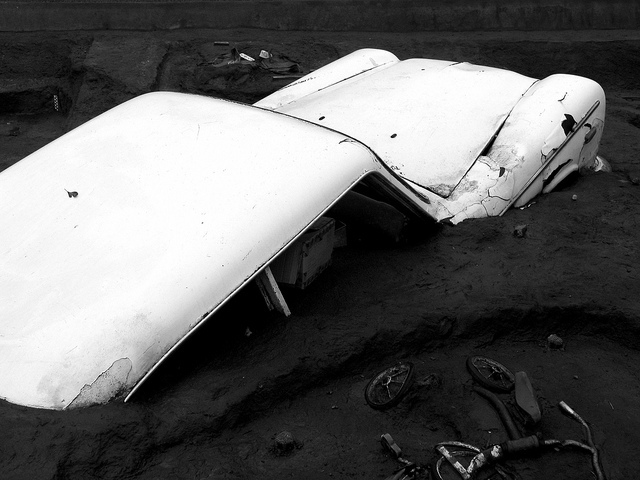 It is an imaginary archeology site of the future, in which numerous typical Shanghai daily objects are excavated from the mud, from watches and kitchen utensils to house parts and Chinese brand cars. Plenty more shots od this art installation in my Flickr stream. It was selected in a composition blog as an example of unusual leading lines: "While to many this may appear as just a car lost in mud, it is the sinuous line formed by the vehicle's contour which really makes it work: a leading line that is itself the subject (not all leading lines are all that thin)."